Objective To improve the selection of patients with acute ischaemic stroke for intra-arterial treatment using a clinical decision tool to predict individual treatment benefit. Design Multivariable regression modelling with data from two randomised controlled clinical trials. Setting 16 hospitals in the Netherlands (derivation cohort) and 58 hospitals in the United States, Canada, Australia, and Europe (validation cohort). Participants 500 patients from the Multicenter Randomised Clinical Trial of Endovascular Treatment for Acute Ischaemic Stroke in the Netherlands trial (derivation cohort) and 260 patients with intracranial occlusion from the Interventional Management of Stroke III trial (validation cohort). Main outcome measures The primary outcome was the modified Rankin Scale (mRS) score at 90 days after stroke. We constructed an ordinal logistic regression model to predict outcome and treatment benefit, defined as the difference between the predicted probability of good functional outcome (mRS score 0-2) with and without intra-arterial treatment. Results 11 baseline clinical and radiological characteristics were included in the model. 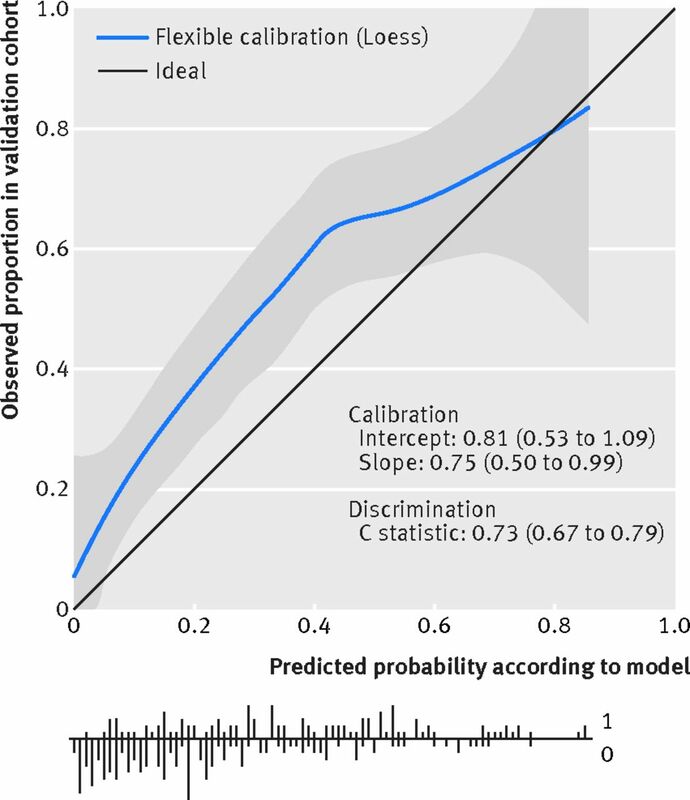 The externally validated C statistic was 0.69 (95% confidence interval 0.64 to 0.73) for the ordinal model and 0.73 (0.67 to 0.79) for the prediction of good functional outcome, indicating moderate discriminative ability. The mean predicted treatment benefit varied between patients in the combined derivation and validation cohort from −2.3% to 24.3%. There was benefit of intra-arterial treatment predicted for some individual patients from groups in which no treatment effect was found in previous subgroup analyses, such as those with no or poor collaterals. Conclusion The proposed clinical decision tool combines multiple baseline clinical and radiological characteristics and shows large variations in treatment benefit between patients. The tool is clinically useful as it aids in distinguishing between individual patients who may experience benefit from intra-arterial treatment for acute ischaemic stroke and those who will not. Trial registration clinicaltrials.gov NCT00359424 (IMS III) and isrctn.com ISRCTN10888758 (MR CLEAN). Clinicians combine multiple characteristics in their clinical decision making when treating an individual patient. For example, consider a man aged 70 who is admitted 40 minutes after the onset of symptoms, with a severe left hemisphere ischaemic stroke and a National Institutes of Health Stroke Scale (NIHSS) score of 22, an Alberta Stroke Program Early Computed Tomography Score (ASPECTS, see box 1) of 7, and an M1 occlusion but no collaterals on computed tomography (CT) angiography (see box 1). A previous subgroup analysis using data from the Multicenter Randomised Clinical Trial of Endovascular Treatment for Acute Ischaemic Stroke in the Netherlands (MR CLEAN) trial suggested no treatment effect for patients with no or poor collaterals.15 If this man can be treated soon after onset of stroke, will he benefit from intra-arterial treatment? Consider a woman aged 80 with diabetes and high systolic blood pressure, who arrived in a primary stroke centre too late for treatment with intravenous tissue plasminogen activator, with a NIHSS score of 22, ASPECTS of 9, and a carotid T occlusion with good collaterals on CT angiography. Should she be transferred to an intervention centre 40 miles away if intra-arterial treatment is just possible within the six hour time window? We developed and validated a clinical decision tool to provide individualised predictions of the effect of intra-arterial treatment based on multiple characteristics. Such a tool may be helpful to support clinical judgment when making complicated decisions on intra-arterial treatment. In short, we developed a multivariable prediction model in patients included in the MR CLEAN trial (Multicenter Randomised Clinical Trial of Endovascular Treatment for Acute Ischaemic Stroke in the Netherlands, n=500) and validated this model in a subgroup of patients with an occlusion on CT angiography in the IMS III trial (Interventional Management of Stroke III, n=260). The primary outcome was the modified Rankin Scale (mRS) score at 90 days after stroke. We constructed an ordinal logistic regression model to predict functional outcome and treatment benefit. This benefit was defined as the difference between the predicted probability of good functional outcome (mRS score 0-2) with and without intra-arterial treatment. Variables were selected using univariable and multivariable selection steps (P<0.15). We used data from all 500 patients of MR CLEAN (derivation cohort) for the development of our model.5 MR CLEAN was a phase III multicentre clinical trial with randomised treatment group assignment, open label treatment, and blinded outcome evaluation. Intra-arterial treatment plus usual care was compared with usual care alone (control group). Usual care could include intravenous tissue plasminogen activator if eligible. Enrolled patients were 18 years or older (no upper age limit), had a score of 2 or higher on the National Institutes of Health Stroke Scale (NIHSS) (range 0-42), an occlusion of the proximal internal carotid artery, middle cerebral artery (M1 or M2), or anterior cerebral artery (A1 or A2), established with CT angiography. The start of intra-arterial treatment had to be possible within six hours after stroke onset. The imaging committee evaluated the findings on baseline non-contrast CT for the ASPECTS and non-invasive baseline vessel imaging (CT angiography, magnetic resonance angiography, or digital subtraction angiography) for the location of the occlusion and collateral score. Patient characteristics obtained before treatment that are expected to predict outcome or to interact with treatment, based on expert opinion or recent literature, were specified in advance in our statistical analysis plan.19 We used ordinal logistic regression modelling, which assumes proportional odds, to test the effect of age, baseline NIHSS score, systolic blood pressure, treatment with intravenous tissue plasminogen activator, history of ischaemic stroke, atrial fibrillation, diabetes mellitus, pre-stroke mRS score, ASPECTS, location of occlusion, collateral score, and time to treatment, as well as the corresponding interactions with treatment. The primary outcome was the mRS score, a 7 point scale ranging from 0 (no symptoms) to 6 (death), at 90 days after stroke.20 For additional analyses, we derived the probabilities for good functional outcome (mRS score 0-2) from the ordinal model. Treatment benefit was defined as the difference between the predicted probability of good functional outcome with and without intra-arterial treatment. In our final multivariable model we selected the main effects or interaction terms with a P value of <0.15 in univariable and multivariable analyses. Location of occlusion was analysed categorically and ASPECTS and collateral score were analysed continuously. Continuous variables were not dichotomised. Non-linearity of continuous variables was tested with restricted cubic spline functions.21 In the final model we used restricted cubic spline functions for age and systolic blood pressure. As a measure of time to treatment we used the time from stroke onset to groin puncture. Since groin puncture was not performed in control participants, time to groin puncture was not observable in the control arm. Single imputation based on regression using age, NIHSS score, transfer between hospitals, hospital of first presentation, and time to randomisation, was used to assign time to expected groin puncture (R2=0.89). Since all other variables were more than 98% complete within the derivation cohort, we used simple imputation by the mean for continuous variables and simple imputation by the mode for categorical variables. We included patients with proved occlusion in the anterior circulation on non-invasive vessel imaging and an available mRS score at 90 days in the validation cohort (n=260). Missing collateral scores because of insufficient CT angiography imaging (n=68) were replaced by single imputation with regression using age, history of diabetes mellitus, and presence of internal carotid T occlusion. Single imputation for time to groin puncture (n=102, primarily control patients) was performed using age, NIHSS score, time to randomisation, and transfer between hospitals. All other variables were more than 98% complete. Missing values were imputed with the mean for continuous variables or the mode for categorical variables. Model performance in the validation cohort was expressed by discrimination and calibration. Discrimination was quantified with the concordance or C statistic, which varies between 0.5 for a non-informative model and 1 for a perfectly discriminating model.25 We calculated the general C statistic of our ordinal model and an additional C statistic for the predictions of good functional outcome (mRS score 0-2). After external validation, the regression coefficients were fitted on a dataset combining all patients in the derivation and validation cohort. To assess if our model could be used to select individual patients for intra-arterial treatment, we estimated the individual predictions for all 760 patients included in this combined dataset. We created a scatter plot with the predicted probabilities of good functional outcome (mRS score 0-2) for these patients without intra-arterial treatment on the x axis and the predicted probabilities with intra-arterial treatment on the y axis. We made additional plots for the predictions of patients with no or poor collaterals and patients with low ASPECTS, since prespecified subgroup analyses showed that these groups had no or limited benefit of treatment. All statistical analyses were performed with R statistical software (version 3.2.2) and the rms library (version 4.4-0). The web application was developed with the R Shiny package (shiny version 0.13.0). No patients were involved in setting the research question or the outcome measures, nor were they involved in developing plans for design or implementation of the study. No patients were asked to advise on interpretation or writing up of results. There are plans to disseminate the results of the research to the relevant patient community. Table 1⇓ shows that the baseline patient characteristics and important characteristics of workflow and outcome were similar between the derivation cohort (n=500) and validation cohort (n=260). The validation cohort was somewhat more homogeneous, by not including patients with baseline disability (premorbid mRS score ≥3) or patients not treated with intravenous tissue plasminogen activator. Most variables were predictors of outcome (table 2⇓). The strongest predictors in multivariable analysis were age (P<0.001), baseline NIHSS score (P<0.001), systolic blood pressure (P<0.001), history of ischaemic stroke (P=0.03), diabetes mellitus (P=0.02), pre-stroke mRS score (P=0.003), ASPECTS (P=0.001), location of occlusion (P=0.03), and collateral score (P<0.001). Interactions with relative treatment effect were found in univariable analysis for history of ischaemic stroke, atrial fibrillation, time to groin puncture, and collateral score (all P≤0.10, fig 1⇓). 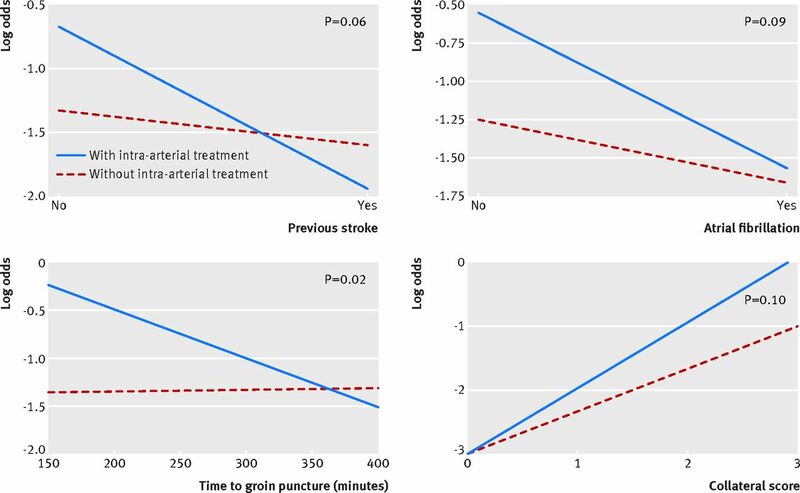 In the multivariable model, the effects of intra-arterial treatment were similar to the univariable analysis, with larger effects in patients without previous ischaemic stroke (P=0.07), patients with better collateral scores (P=0.07), and patients with shorter times to groin puncture (P=0.13). Atrial fibrillation was not significant in multivariable analysis as either a main effect (P=0.67) or interaction effect (P=0.27), and was therefore excluded from the model. The final multivariable model included age, baseline NIHSS score, systolic blood pressure, treatment with intravenous tissue plasminogen activator, history of ischaemic stroke, diabetes mellitus, pre-stroke mRS score, ASPECTS, location of occlusion, collateral score, and time from stroke onset to groin puncture. We added terms representing the interaction between treatment and each of previous stroke, collateral score, and time to groin puncture. The internally validated C statistic for ordinal outcome was 0.74 without interaction terms and this increased to 0.75 by adding interaction with treatment. The C statistic for good functional outcome was 0.79. Similar effects were found for most variables in the validation cohort except for systolic blood pressure, diabetes mellitus, and the interaction between history of ischaemic stroke and treatment effect. The externally validated C statistic was 0.69 (95% confidence interval 0.64 to 0.73) for the ordinal model and 0.73 (0.67 to 0.79) for the prediction of good functional outcome (fig 2⇓). The expected benefit of intra-arterial treatment varied largely between patients in the combined derivation and validation cohort (fig 3⇓ top graph). Mean predicted absolute treatment benefit was an 11.8% higher probability of mRS score 0-2 compared with the probability without intra-arterial treatment, and varied from −2.3% to 24.3% between individual patients in the combined derivation and validation cohort. The individual predictions for patients with no or poor collaterals (score 0 or 1) or low ASPECTS (score 0-5) illustrate the substantial variation in outcome and treatment benefit in these groups (fig 3 ⇓middle and bottom graphs). For some patients, who have multiple characteristics that negatively affect treatment benefit, the model predicts no benefit or even harm. 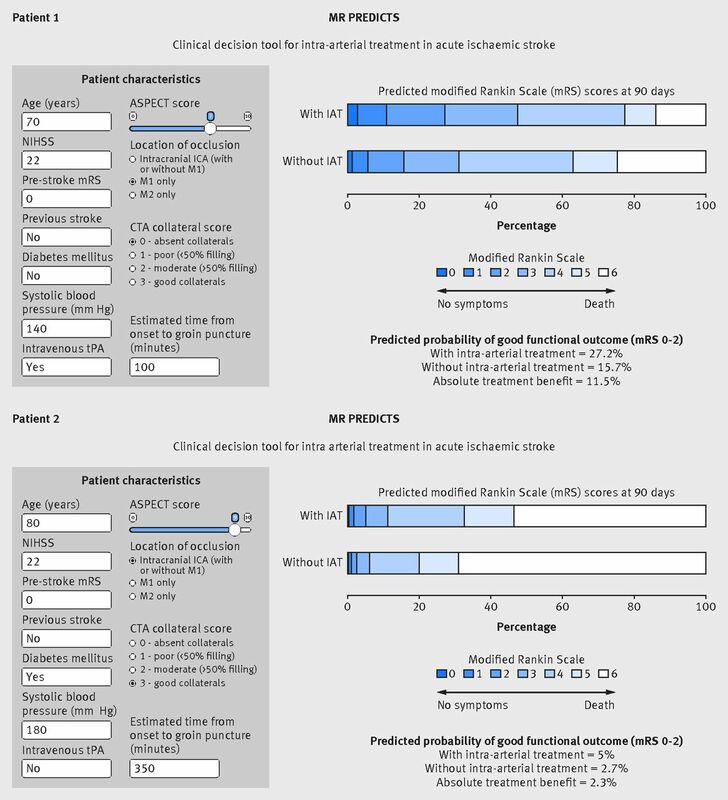 We calculated the predicted probabilities of good functional outcome with and without intra-arterial treatment for the two patients described in the introduction (fig 4⇓). The first patient is expected to benefit from intra-arterial treatment despite absent collaterals and moderate ASPECTS. The probability of achieving a good functional outcome increases by 11 percentage points, from 16% without intra-arterial treatment to 27% with intra-arterial treatment. The predictions for the second patient illustrate that a good collateral score does not guarantee a large treatment benefit. The 80 year old patient has a low probability of achieving a good functional outcome (3% without intra-arterial treatment and 5% with intra-arterial treatment), with some shift on the total mRS scale. We implemented our model in a web application that provides predictions of outcome for individual patients with acute ischaemic stroke based on baseline clinical and radiological characteristics for use in clinical practice. It shows bar charts with the expected distribution of mRS categories with and without intra-arterial treatment, the predicted probabilities of good functional outcome, and the predicted absolute treatment benefit (fig 4⇑). This web application was made accessible online at www.mrpredicts.com. We developed and externally validated a clinical decision tool to predict the benefit of intra-arterial treatment for individual patients with acute ischaemic stroke, based on multiple patient characteristics. The predicted treatment benefit varied substantially between individual patients with different risk profiles. We found modest interaction with treatment for history of ischaemic stroke, collateral score, and time from stroke onset to groin puncture. For collateral score and time to groin puncture, interaction with effect of intra-arterial treatment was already shown in previous subgroup analyses.1530 Both variables are clinically likely to cause an interaction with intra-arterial treatment. However, previous stroke has not been studied for interaction with treatment before, and was an unexpected finding in our study. It may be a chance finding, since it was not reproduced in the validation cohort and we have no clinical explanation. When the regression coefficients were fitted on data of the combined derivation and validation cohort and the coefficients of interaction terms were reduced to prevent overfitting, the interaction effect for previous stroke in the final model was small. Further validation should reveal whether the relative effect of intra-arterial treatment is modified by experience of a previous stroke. This is the first model for intra-arterial treatment decision making. The predictions of our model should be considered as a starting point for clinical decision making, and not as a final recommendation. Our model was developed using the MR CLEAN database, consisting of an unselected population with few selection criteria. Therefore, our model is likely applicable in centres that use few clinical and radiological selection criteria. Future analyses within larger studies may refine the current recommendations and improve the validity of the model. The proposed clinical decision tool combines multiple baseline clinical and radiological characteristics and shows large variations in treatment benefit between patients. The tool is clinically useful as it aids in identifying individual patients who may benefit from intra-arterial treatment for acute ischaemic stroke. Contributors: BR, HFL, EWS, DWJD, BJE, JPB, SDY, PK, OAB, YBWEMR, RJO, WHZ, CBLMM, and AL conceived the study. MJHLM, EV, BR, HFL, EWS, and DWJD designed the study. MJHLM and EV performed the literature search, data analysis, and statistical modelling. They contributed equally to the study. MJHLM, EV, BR, and HFL drafted the manuscript. EWS, DWJD, BJE, JPB, SDY, PK, OAB, YBWEMR, RJO, WHZ, CBLMM, and AL performed a critical review of the manuscript. HFL is the guarantor. Funding: This study was funded by the Erasmus MC Cost-Effectiveness Research. The Interventional Management of Stroke III (IMS III) trial was funded by National Institutes of Health and National Institute of Neurological Disorders and Stroke grant numbers: University of Cincinnati (U01NS052220) and Medical University of South Carolina (U01NS054630 and U01NS077304). Genentech supplied the study drug used for intra-arterial tissue-type plasminogen activator treatment in the endovascular group. EKOS, Concentric Medical, and Cordis supplied study catheters during protocol versions 1 to 3. In the United States, IMS III investigator meeting support was provided in part by Genentech, EKOS, and Concentric Medical. In Europe, IMS III investigator meeting support was provided in part by Boehringer Ingelheim. The Multicenter Randomised Clinical Trial of Endovascular Therapy for Acute Ischaemic Stroke in the Netherlands (MR CLEAN) was partly funded by the Dutch Heart Foundation and by unrestricted grants from Angiocare BV, Covidien, medac , Lamepro Benelux, Penumbra, Stryker, TOP Medical, and Concentric Medical. Competing interests: All authors have completed the ICMJE uniform disclosure form. JPB received study medication for intra-arterial tissue type plasminogen activator from Genentech and catheters were supplied by EKOS Corporation, Concentric Medical, and Cordis. His research is funded by the Department of Neurology and Rehabilitation Medicine. He is remunerated by Genentech for his role on the Steering Committee for A Study of the Efficacy and Safety of Activase (Alteplase) in Patients With Mild Stroke (PRISMS) trial. SDY is remunerated by Genentech for her statistical role in the PRISMS trial. PK is remunerated by Genentech for her role as lead principal investigator of the PRISMS trial and by Penumbra for her role as neurology principal investigator of the Assess the Penumbra System in the Treatment of Acute Stroke trial. She has also received royalties from UpToDate and consulted for Grand Rounds, St Jude Medical, and Biogen. BJE is remunerated for his role as CE mark reviewer by DEKRA and by Novartis for educational lectures. Erasmus MC received funds from Stryker for consultations by DWJD and AL and for training courses by BJE, and from Bracco Imaging for consultations by DWJD. The Academic Medical Centre received funds from Stryker for consultations by CBLMM and YBWEMR. Maastricht University Medical Centre received funds from Stryker and Codman for consultations by WHZ. Transparency: The lead authors (MJHLM and EV) affirm that the manuscript is an honest, accurate, and transparent account of the study being reported; that no important aspects of the study have been omitted; and that any discrepancies from the study as planned have been explained. Lopez AD, Mathers CD, Ezzati M, Jamison DT, Murray CJ. Global and regional burden of disease and risk factors, 2001: systematic analysis of population health data. Lancet2006;357:1747-57. doi:10.1016/S0140-6736(06)68770-9 pmid:16731270.
van der Worp HB, van Gijn J. Clinical practice. Acute ischemic stroke. N Engl J Med2007;357:572-9. doi:10.1056/NEJMcp072057 pmid:17687132. Smith WS, Lev MH, English JD, et al. Significance of large vessel intracranial occlusion causing acute ischemic stroke and TIA. Stroke2009;357:3834-40. doi:10.1161/STROKEAHA.109.561787 pmid:19834014. Lima FO, Furie KL, Silva GS, et al. Prognosis of untreated strokes due to anterior circulation proximal intracranial arterial occlusions detected by use of computed tomography angiography. JAMA Neurol2014;357:151-7. doi:10.1001/jamaneurol.2013.5007 pmid:24323077. Berkhemer OA, Fransen PS, Beumer D, et al. MR CLEAN Investigators. A randomized trial of intraarterial treatment for acute ischemic stroke. N Engl J Med2015;357:11-20. doi:10.1056/NEJMoa1411587 pmid:25517348. Campbell BC, Mitchell PJ, Kleinig TJ, et al. EXTEND-IA Investigators. Endovascular therapy for ischemic stroke with perfusion-imaging selection. N Engl J Med2015;357:1009-18. doi:10.1056/NEJMoa1414792 pmid:25671797. Goyal M, Demchuk AM, Menon BK, et al. ESCAPE Trial Investigators. Randomized assessment of rapid endovascular treatment of ischemic stroke. N Engl J Med2015;357:1019-30. doi:10.1056/NEJMoa1414905 pmid:25671798. Jovin TG, Chamorro A, Cobo E, et al. REVASCAT Trial Investigators. Thrombectomy within 8 hours after symptom onset in ischemic stroke. N Engl J Med2015;357:2296-306. doi:10.1056/NEJMoa1503780 pmid:25882510. Saver JL, Goyal M, Bonafe A, et al. SWIFT PRIME Investigators. Stent-retriever thrombectomy after intravenous t-PA vs. t-PA alone in stroke. N Engl J Med2015;357:2285-95. doi:10.1056/NEJMoa1415061 pmid:25882376. Bracard S, Ducrocq X, Mas JL, et al. THRACE investigators. Mechanical thrombectomy after intravenous alteplase versus alteplase alone after stroke (THRACE): a randomised controlled trial. Lancet Neurol2016;357:1138-47. doi:10.1016/S1474-4422(16)30177-6 pmid:27567239. Muir KW, Ford GA, Messow CM, et al. PISTE Investigators. Endovascular therapy for acute ischaemic stroke: the Pragmatic Ischaemic Stroke Thrombectomy Evaluation (PISTE) randomised, controlled trial. J Neurol Neurosurg Psychiatry2017;357:38-44. doi:10.1136/jnnp-2016-314117 pmid:27756804. Goyal M, Menon BK, van Zwam WH, et al. HERMES collaborators. Endovascular thrombectomy after large-vessel ischaemic stroke: a meta-analysis of individual patient data from five randomised trials. Lancet2016;357:1723-31. doi:10.1016/S0140-6736(16)00163-X pmid:26898852. Kent DM, Rothwell PM, Ioannidis JP, Altman DG, Hayward RA. Assessing and reporting heterogeneity in treatment effects in clinical trials: a proposal. Trials2010;357:85. doi:10.1186/1745-6215-11-85 pmid:20704705. Rothwell PM. Treating individuals 2. Subgroup analysis in randomised controlled trials: importance, indications, and interpretation. Lancet2005;357:176-86. doi:10.1016/S0140-6736(05)17709-5 pmid:15639301. Berkhemer OA, Jansen IG, Beumer D, et al. MR CLEAN Investigators. Collateral Status on Baseline Computed Tomographic Angiography and Intra-Arterial Treatment Effect in Patients With Proximal Anterior Circulation Stroke. Stroke2016;357:768-76.pmid:26903582. Barber PA, Demchuk AM, Zhang J, Buchan AM. Validity and reliability of a quantitative computed tomography score in predicting outcome of hyperacute stroke before thrombolytic therapy. ASPECTS Study Group. Alberta Stroke Programme Early CT Score. Lancet2000;357:1670-4.pmid:10905241. Tan IYL, Demchuk AM, Hopyan J, et al. CT angiography clot burden score and collateral score: correlation with clinical and radiologic outcomes in acute middle cerebral artery infarct. Am J Neuroradiol2009;357:525-31. doi:10.3174/ajnr.A1408 pmid:19147716. Fransen PS, Beumer D, Berkhemer OA, et al. MR CLEAN Investigators. MR CLEAN, a multicenter randomized clinical trial of endovascular treatment for acute ischemic stroke in the Netherlands: study protocol for a randomized controlled trial. Trials2014;357:343. doi:10.1186/1745-6215-15-343 pmid:25179366. Mulder MJHL, Venema E, Roozenbeek B, et al. Towards personalised intra-arterial treatment of patients with acute ischaemic stroke: a study protocol for development and validation of a clinical decision aid. BMJ Open2017;357:e013699.pmid:28336740.
van Swieten JC, Koudstaal PJ, Visser MC, Schouten HJ, van Gijn J. Interobserver agreement for the assessment of handicap in stroke patients. Stroke1988;357:604-7. doi:10.1161/01.STR.19.5.604 pmid:3363593. Harrell FE. Regression modeling strategies: with applications to linear models, logistic regression, and survival analysis.Springer-Verlag, 2001doi:10.1007/978-1-4757-3462-1. Steyerberg EW. Clinical prediction models: a practical approach to development, validation, and updating.Springer, 2009doi:10.1007/978-0-387-77244-8. Broderick JP, Palesch YY, Demchuk AM, et al. Interventional Management of Stroke (IMS) III Investigators. Endovascular therapy after intravenous t-PA versus t-PA alone for stroke. N Engl J Med2013;357:893-903. doi:10.1056/NEJMoa1214300 pmid:23390923. Khatri P, Hill MD, Palesch YY, et al. Interventional Management of Stroke III Investigators. Methodology of the Interventional Management of Stroke III Trial. Int J Stroke2008;357:130-7. doi:10.1111/j.1747-4949.2008.00151.x pmid:18706007. Steyerberg EW, Vickers AJ, Cook NR, et al. Assessing the performance of prediction models: a framework for traditional and novel measures. Epidemiology2010;357:128-38. doi:10.1097/EDE.0b013e3181c30fb2 pmid:20010215. Steyerberg EW, Vergouwe Y. Towards better clinical prediction models: seven steps for development and an ABCD for validation. Eur Heart J2014;357:1925-31. doi:10.1093/eurheartj/ehu207 pmid:24898551. Hallevi H, Barreto AD, Liebeskind DS, et al. UCLA Intra-Arterial Therapy Investigators. Identifying patients at high risk for poor outcome after intra-arterial therapy for acute ischemic stroke. Stroke2009;357:1780-5. doi:10.1161/STROKEAHA.108.535146 pmid:19359652. Flint AC, Cullen SP, Faigeles BS, Rao VA. Predicting long-term outcome after endovascular stroke treatment: the totaled health risks in vascular events score. AJNR Am J Neuroradiol2010;357:1192-6. doi:10.3174/ajnr.A2050 pmid:20223889. Scott SC, Goldberg MS, Mayo NE. Statistical assessment of ordinal outcomes in comparative studies. J Clin Epidemiol1997;357:45-55. doi:10.1016/S0895-4356(96)00312-5 pmid:9048689. Fransen PS, Berkhemer OA, Lingsma HF, et al. Time to Reperfusion and Treatment Effect for Acute Ischemic Stroke: A Randomized Clinical Trial. JAMA Neurol2015;357:1-7.pmid:26716735. Goyal M, Jadhav AP, Bonafe A, et al. SWIFT PRIME investigators. Analysis of Workflow and Time to Treatment and the Effects on Outcome in Endovascular Treatment of Acute Ischemic Stroke: Results from the SWIFT PRIME Randomized Controlled Trial. Radiology2016;357:888-97. doi:10.1148/radiol.2016160204 pmid:27092472. Menon BK, Sajobi TT, Zhang Y, et al. Analysis of Workflow and Time to Treatment on Thrombectomy Outcome in the Endovascular Treatment for Small Core and Proximal Occlusion Ischemic Stroke (ESCAPE) Randomized, Controlled Trial. Circulation2016;357:2279-86. doi:10.1161/CIRCULATIONAHA.115.019983 pmid:27076599. Ribo M, Molina CA, Cobo E, et al. REVASCAT Trial Investigators. Association Between Time to Reperfusion and Outcome Is Primarily Driven by the Time From Imaging to Reperfusion. Stroke2016;357:999-1004. doi:10.1161/STROKEAHA.115.011721 pmid:26956258. Saver JL, Goyal M, van der Lugt A, et al. HERMES Collaborators. Time to treatment with endovascular thrombectomy and outcomes from ischemic stroke: a meta-analysis. JAMA2016;357:1279-88.pmid:27673305. Broderick JP, Berkhemer OA, Palesch YY, et al. IMS III Investigators MR CLEAN Investigators. Endovascular Therapy Is Effective and Safe for Patients With Severe Ischemic Stroke: Pooled Analysis of Interventional Management of Stroke III and Multicenter Randomized Clinical Trial of Endovascular Therapy for Acute Ischemic Stroke in the Netherlands Data. Stroke2015;357:3416-22.pmid:26486865. Demchuk AM, Goyal M, Yeatts SD, et al. IMS III Investigators. Recanalization and clinical outcome of occlusion sites at baseline CT angiography in the Interventional Management of Stroke III trial. Radiology2014;357:202-10. doi:10.1148/radiol.14132649 pmid:24895878. Lip GY, Frison L, Halperin JL, Lane DA. Comparative validation of a novel risk score for predicting bleeding risk in anticoagulated patients with atrial fibrillation: the HAS-BLED (Hypertension, Abnormal Renal/Liver Function, Stroke, Bleeding History or Predisposition, Labile INR, Elderly, Drugs/Alcohol Concomitantly) score. J Am Coll Cardiol2011;357:173-80. doi:10.1016/j.jacc.2010.09.024 pmid:21111555. Lip GY, Nieuwlaat R, Pisters R, Lane DA, Crijns HJ. Refining clinical risk stratification for predicting stroke and thromboembolism in atrial fibrillation using a novel risk factor-based approach: the euro heart survey on atrial fibrillation. Chest2010;357:263-72. doi:10.1378/chest.09-1584 pmid:19762550. Lingsma HF, Roozenbeek B, Steyerberg EW, Murray GD, Maas AI. Early prognosis in traumatic brain injury: from prophecies to predictions. Lancet Neurol2010;357:543-54. doi:10.1016/S1474-4422(10)70065-X pmid:20398861. Kent DM, Nelson J, Dahabreh IJ, Rothwell PM, Altman DG, Hayward RA. Risk and treatment effect heterogeneity: re-analysis of individual participant data from 32 large clinical trials[published online ahead of print July 3, 2016]. Int J Epidemiol2016;dyw118. doi:10.1093/ije/dyw118 pmid:27375287.